This film is a documentary directed by R.J. Cutler which conveys the painstaking process of how Vogue magazine compiles its ‘Fall fashion Bible,’ the September issue. 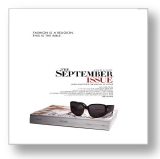 In 2007, the September issue of Vogue weighed nearly 5 pounds and was the single largest issue of a magazine ever published. Vogue’s long time editor-in-chief, Anna Wintour, (who was the inspiration for Meryl Streep’s role in “The Devil Wears Prada” is shadowed by a camera crew that appears to have unlimited access to the fashion CEO’s daily planner. If you have any interest in fashion at all you will appreciate this film as it is full of beautiful clothing and beautiful people. From the runway fashion shows in Paris and New York to the photos shoots in Rome, the film is eye candy for any fashionista at heart. You’ll also come away with a real understanding of the team effort that goes into compiling the magazine. On the same hand, however, you are made aware of the veto power of one person and that person is Anna Wintour. One does wonder if the film was made as a rebuttal to the film, “The Devil Wears Prada.” Anna is portrayed in this documentary film as an extremely hard working editor who can make decisions faster than any runway model can change her lipstick color. Although, she doesn’t appear to be anywhere near the manipulator as shown in the fiction version nor as cold hearted. Make no mistake; she knows the power she carries and is not afraid to use it. Her attention to detail is relentless and nothing gets past her desire for perfection. She even told a cameraman that he should go the gym! We are taken inside Anna’s world and introduced to her longtime Creative Director, Grace Coddington a former British model. She is a somewhat earthy looking lady and dresses in an opposite manner to Wintour; who wears designer short cap-sleeve printed dresses with the same style short necklace, which appears to be her look of choice. Grace wears comfortable cotton skirts and loose fitting blouses and very comfy shoes. Both women have an undeniable trust and respect for one another although Grace is at a disadvantage because she can always be vetoed in the end. I found both women to be intelligent, interesting and strong characters that provide viewers with a true snap shot of the inner workings of Vogue. Wintour certainly doesn’t have a tolerance for anyone wasting her time. She tells a designer to ‘get on with it’ and also hurries her staff. I didn’t view this as the bad quality as was depicted in “The Devil Wears Prada.” She’s running an international high-powered magazine that influences fashion throughout the world. No one should be wasting her time. She doesn’t smile much nor laugh which I found to be sad. She’s surrounded by the most beautiful clothing in the world and has a cynical attitude about her job. Especially when talking about her father and siblings professions. We get the sense that she isn’t content and that’s the sadness in the film. Her daughter is seen from time to time and has no desire to be in the business. I would have appreciated seeing more of her private life. I adore fashion and worked at two different clothing boutiques during my college years. I subscribe to numerous fashion magazines and have always indulged myself in the glossy pages of the imaginary fashion shoots. Yes, to me, fashion is an individual statement-one which allows you to express your creativity and simply have fun. Perhaps someday I will meet Anna Wintour. I have so many questions I’d like to ask her and I’d like to thank her for making my fashion world much more exciting.